Hazard Control – Farm Safety Nova Scotia – Safe Farming. Safe Families. Safe Employees. Identify controls required to manage identified hazards. order to keep everyone safe on the farm. their work effectively and safely. Ideally, you will be able to eliminate a hazard completely. Examples include removing trip hazards on a floor or safely disposing of unnecessary chemicals. If you cannot remove a hazard completely, you must reduce the risk of injury as much as possible through the methods below – in order of effectiveness. If a hazard cannot be removed, you should substitute with something safer, if possible. This involves replacing something that causes a hazard with something that does not cause a hazard. Examples include using a less toxic chemical, using smaller containers to reduce the weight of items for manual handling, or using scaffolding instead of ladders to reduce a fall hazard. If you cannot remove a hazard completely or substitute with something safer, you must implement engineering controls to create a physical barrier around the hazard. This involves isolating the hazard or ensuring proper guarding around moving equipment and machinery parts. Examples include using soundproof barriers to reduce noise levels, using an enclosed booth for spray painting, using remote control systems to operate equipment, installing safety switches, installing guards, or using hoists to move heavy loads. If you cannot remove a hazard completely, substitute with something safer or implement engineering controls to reduce the hazard, you must establish administrative processes to ensure your workers are not exposed to the hazard. This involves developing safe work procedures, providing worker training and supervision, and using signage and warning labels. Preventative maintenance and housekeeping are also examples of administrative controls – keep your farm tidy, ensure equipment is maintained according to manufacturer specifications. Remember, prevention is key. Implementing administrative controls can often be a bit challenging on-farm, especially keeping the required records; however, it is critical to develop these controls when a hazard cannot be completely controlled by elimination, substation or engineering. There are a number of different types of administrative controls that can be used – most often they are used in combination. Personal protective equipment (PPE) is the least reliable form of protection and should be the last line of defence. It should be used only as a last resort after you have exhausted all other possible methods of reducing a hazard, or in the short term until you have organized a better and more reliable method of hazard control. If you require your workers to use PPE, you must ensure that the right type of PPE is selected for the job. You must also ensure that the PPE fits the worker properly and is comfortable under working conditions, that your workers are trained in the need for PPE and how to use and maintain it, and that the PPE is stored in a clean and fully operational condition. Examples of PPE use include gloves to reduce potential hand injuries, respirators, hearing and eye protection, high-visibility clothing, and fall-arrest harnesses when working at heights. 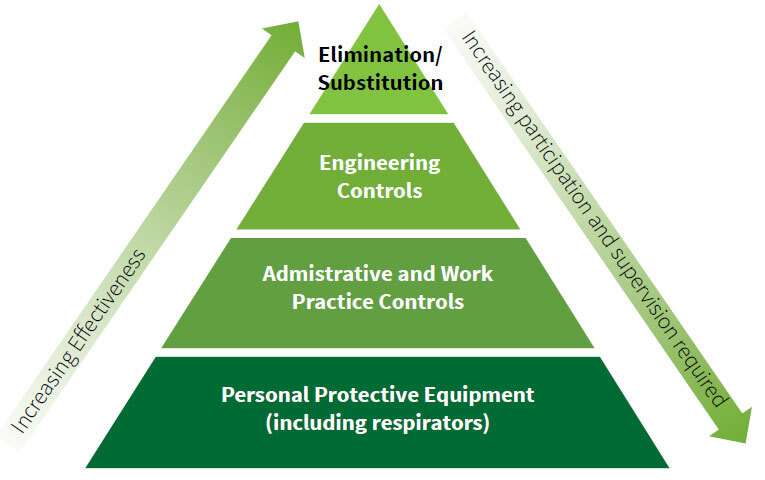 If using respirators, a respiratory protection program is required. See workbook for an example. Safe work practices and written work procedures are terms that are often used interchangeably; however, that is not the case. Safe work practices (SWP) are a written method of how to perform a job safely, with minimum risk to the people, animals, equipment and environment. SWP provide general safety precautions, but do not necessarily outline the step-by-step process to be followed.Written work procedures (WWP) are a step-by-step guide on how to perform a task from start to finish including safety precautions that must be taken while performing the task. Many farms have standard operating procedures (SOPs) developed for certain tasks. For the purpose of your farm safety plan you do not need to re-create these procedures but should add a safe work practice section to the existing procedure or refer to the SOP in the SWP. So then the question remains, how do you determine whether a safe work practice is required or a written work procedure? Written work procedures are often dictated by regulation. There are a number of regulations that require written work procedures be developed. You must also take into account the hazard and risks associated with the task and determine which is most appropriate for that task. Higher risk tasks often require more detailed instruction, and therefore a written work procedure. Tasks involving lower risk may simply require a safe work practice. Using the task hazard analysis to develop the SWP/WWP makes the task of writing them much easier. There are a number of ways to draft a SWP and a WWP. The most important thing to keep in mind is that it must be in a format that is appropriate for your workers. This may mean using photos to illustrate the steps would be more appropriate than formally writing the procedure. Nova Scotia’s Small Business Safety Toolkit suggests that one way of writing a safe work practice is to transfer the information from your task analysis worksheet into a narrative format. Drive the vehicle off the road to an area well clear of traffic, even if it requires rolling on a flat tire. Turn on the emergency flashers to alert passing drivers so they will not hit you. Choose a firm, level area so you can jack up the vehicle without it rolling. Apply the parking brake, leave transmission in gear or PARK, place blocks in front and back of the wheel diagonally opposite the flat. This will also help prevent the vehicle from rolling. To avoid back strain, turn the spare tire into an upright position in the wheel well. Stand as close to the trunk as possible and slide the spare tire close to your body. Lift the spare tire out of the trunk onto the ground, and roll it to the flat tire. As you develop your safe work practices, ensure any hazard controls that are repeated throughout are identified early in the document. In the changing tire example, you could include a note at the beginning to advise workers that the activity requires them to use correct lifting, carrying and handling techniques. And – most importantly – ensure your workers are made aware of and trained in the safe work practices. As an employer, it is your obligation to provide instruction and training for your employees – the type of training will depend on your operations and the hazards identified for your farm. Some formats of training are ongoing, such as the ongoing review of the farm’s safety practices during team meetings, regular inspections and hazard assessments. Other training is specifically regulated (e.g. WHMIS, First Aid, Confined Space). While the regulations specify certain training requirements it does not exclude you from providing other training (e.g. training employee to prune). As the employer you are responsible to make sure that your employees receive all required training to perform their tasks safely. There are a number of supports employers can access in order to make sure their employees are properly equipped to work safely on the farm. Farm Safety Nova Scotia provides a number of opportunities for orientation and training support with upcoming workshops listed on their website as well as providing an Online Training Campus. While training and orientation is imperative for new employees to the farm for obvious reasons – this training is also a good refresher for all employees. It provides an opportunity to review the day-to-day operation, emergency procedures, an overview of first aid facilities, restricted areas (if any exist), hazard controls and any other applicable health and safety procedures, plans, policies or programs. Basic training should cover the content of the farm’s safety plan and must be conducted before the new employee is exposed to any of the assessed hazards on the farm. Overview of the farm operation. The rights and responsibilities of workers. How to safely perform each task. Hazard identification and control management. On-the-job training is an important aspect of a new employee’s orientation. This allows them to job shadow their employer, or another employee, in their designated role to learn how a task is done properly before attempting it, under supervision, themselves. You may have a formal sit down orientation with a new worker to review the basics of the farm’s safety plan, but then on the- job training will continue with that worker as they are introduced to their tasks. It is important to keep a record of all training programs that take place on the farm. Information should include the date, time, specific training program, and participants. Have participants sign the documentation to confirm they received the training and understood what was taught. See your workbook to develop a list of required training and training records for your farm. Whichever method or combination of methods of hazard control you use, you must ensure it does not create a new or different hazard. For example, if you install a ventilation system to resolve an air-quality issue, you need to also ensure that the ventilation system does not create a noise problem. Similarly, if the hazard requires the use of safety footwear, make sure they fit the worker properly and do not cause a tripping hazard.